Also needing replacement is the dragon’s horn. When deployed 8 years ago, the horn – made of a real elk horn – had been sticking up from the middle of the dragon’s head. Now it is gone. 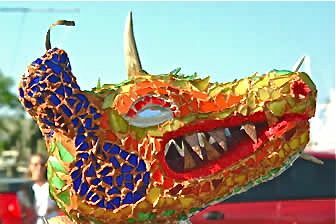 The photo on top was taken when the dragon was launched in 2004 and shows a more golden pigment (since bleached by the sun) and a prominent horn. In the photo taken this week in Gary Gresko’s studio, there’s no horn on snout (Gary says a heron took it off) and the dragon has a palid complexion. Both of those vanities will be attended to in the refit. Gary Gresko lays blame for the damage on a heron. Or maybe multiple herons. The horn was right in the spot on the dragon’s head where a heron perched, and had been photographed often. It was a scene to behold, and passersby would stop to take in the heron-on-the-dragon. The dragon’s sculptor is less admiring of that interplay between art and nature. Bird and animals, Gresko says, “plop around” and break dragon parts. A photo from last June, that was On The Cover of TownDock.net, shows a green heron standing where the elk horn once was. As the birds likely won’t listen to his imploring, Gresko’s working out ways to otherwise persuade the birds from perching on his sculpture. Namely, “more sharp things sticking up” around the base of the dragon and on its head. This time around, Gresko says, the spiky horn sticking out of the dragon’s head will be “deeper, stronger and sharper.” The point, he says, is to “make it uncomfortable” for herons and wildlife. Gary Gresko initially figured the cost of materials and labor to be about $500, but it may be higher given the price of the copper needed for the keel. If you have materials to donate — thin mirrored glass that is thin or colored mirrored glass pieces (not plate; less than 1/4 inch) could be a help. (Gary says he has enough of the Yeungling green glass beer bottles. ) Also needed are copper sheathing, copper pipe or plate. If you’d like to make a financial donation, send it directly to Gary Gresko at PO Box 284, Oriental, NC 28571. 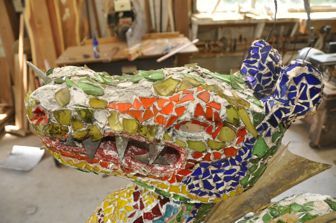 For the March 2004 story about the dragon being built, click here. For the May 2004 story about the dragon’s launch in to the Duck Pond, click here. For view of a bird on the Duck Pond dragon’s back, click here. For the On The Cover photo of a green heron on the Duck Pond dragon’s snout, click here. 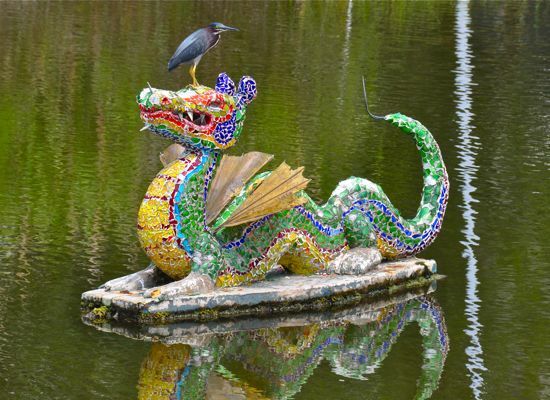 Duck Pond dragon as seen in a 2009 On The Cover photo. This dragon is not the first to grace the Oriental Duck Pond. Compared to an earlier Duck Pond dragon’s travails, this one is faring pretty well. It was stolen by teenagers — and recovered by then police chief Jim Bunn. Its anchor at that time, says Grace, “was a cement block and its leash was usually chain link that could rust out or get kinked. That dragon also “got beat up in two hurricanes and finally broke up,” Grace Evans says. “It was low tech as you can see from the part I salvaged.” The head of that earlier dragon is at the Oriental History Museum. The town went a few years without a Duck Pond dragon before the 2004 launching of the dragon that is now being repaired.